I really, really wanted to love this, but overall this special edition of Lightspeed is just OK. The best stories here are reprints: Tiptree's haunting "Love is the Plan, the Plan is Death", Eleanor Arnason's charming take on Bashō, "Knapsack Poems" (although this strikes me more as fantasy than science fiction), and Maureen McHugh's novella "The Cost to Be Wise", which would eventually be expanded into her fine novel, 'Mission Child'. None of the new work is anywhere near as strong but the opening story by Seanan McGuire, "Each to Each" is compelling (at least, after a few terribly clunky initial paragraphs) and I also found N.K Jemisin's "Walking Awake" a thoughtful piece. "Dim Sun" (Maria Dahvana Headley) is great fun, especially if you're a foodie like I am, "The Sisterhood of Ick" by Charlie Jane Anders felt a little manipulative but was still a pretty good read, and I enjoyed Rhonda Eikamp's "The Case of the Passionless Bees", an sfnal take on Sherlock Holmes, despite the fact that it contained no real mystery at all. But the other new pieces were less engaging and many felt rather tired and predictable, a judgment I found taking hold more deeply as I moved into the flash fiction and the many essays. Only Pat Murphy's passionate, articulate histories of the Tiptree award and Kameron Hurley's justly praised 'We Have Always Fought: Challenging the Women, Cattle, and Slaves Narrative' had much to offer beyond bland exhortations to keep on keeping on...or something. Again, none of this is bad (well...OK, a couple of pieces here are bad but I'm being nice and really they're just a tiny blip in a larger whole), but so much of it feels tired and over-done and kind of stale. Not very destructive or revolutionary. 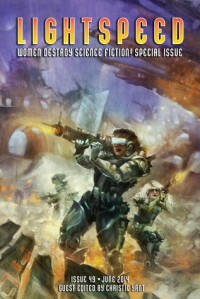 There are just so many damn good, really fresh and exciting female SF writers out there that I can't help but wonder why they're not present in this anthology. I know these things take time and commissioning work is a crap-shoot because the writers one desperately wants aren't always interested or available, but where are the writers like Catherynne Valente, Aliette de Bodard, Yoon Ha Lee, L. Timmel Duchamp, Jennifer Marie Brisset, Carmen Maria Machado, Gwyneth Jones, Vandana Singh, Andrea Hairston and others? These are women who are not just "destroying" science fiction as we know it but rebuilding it in new and beautiful, previously unknown forms. I wish this volume had focused more on writers like these and less on the same old stuff written with different third-person pronouns.